Creative Blog is a simple WordPress blog theme with beautiful design and flexible functionality.The theme is a perfect match of beautiful and professional layouts. This theme is made for any search engine, SEO Compatible. Bootstrap Framework based so it’s totally responsive. Html5 and css3 based coded. 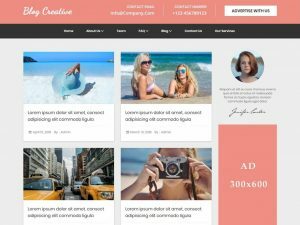 It is multipurpose theme you case use for adult business, adult blog, paysite, tube site, gallery and more. Customizer control is very simple to manage backed. The theme is compatible with all types of page builders like visual composer, divi builder, Elementor, gutenberg and so on. Theme main part is homepage including slider and services section, recent posts, and about us section.